We have a new steel chalkboard in our kitchen – floor to ceiling with lots of space to capture grocery lists, homework assignments, you name it. I put a quote up the other day from Parker Palmer, a wonderful thinker and beautiful writer. “Spring teaches me to look more carefully for the green stems of possibility,” he said. 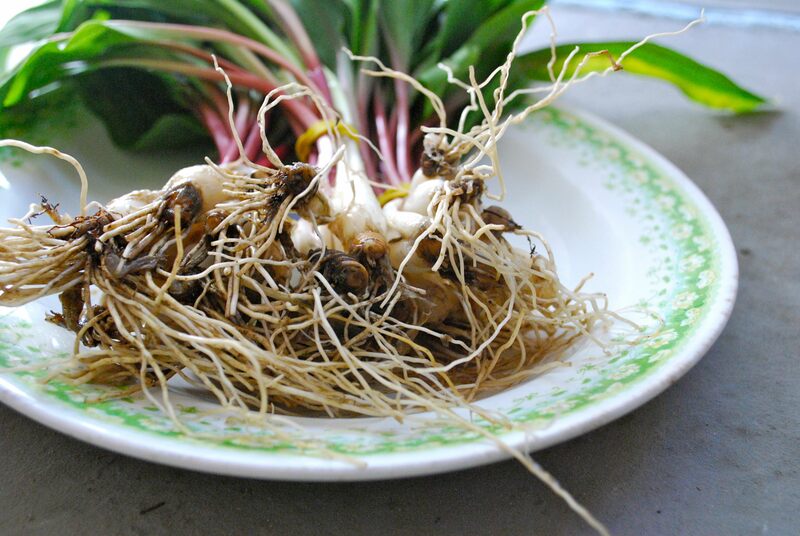 He’s so right whether you’re talking about relationships, work or new ways of doing things, or asapargus, chives and ramps. This pie embodies the latter, with a helping of lemon thyme and fresh chives as well. 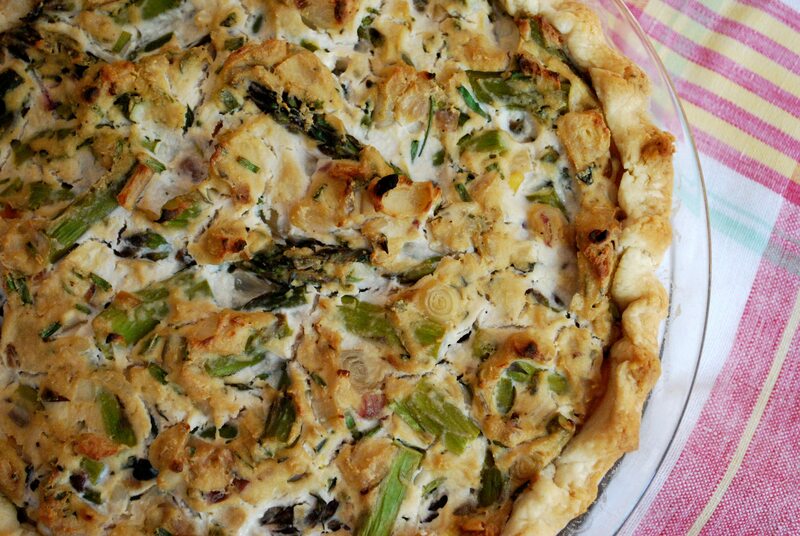 All early spring plants that infuse this simple pie with … well, green stems and possibility. For the pâte brisée, whisk the flour and salt together in a mixing bowl. Add the shortening by cutting it into small pieces and then, using your hands or a pastry cutter, blend it into the flour working it into pea-sized pieces until it resembles a coarse crumb. Add the iced water, beginning with only 3 tablespoons, mixing enough to form a ball (do not over mix or your pâte will become stiff). Add more if you need it but it might not be necessary. Flatten the ball into a disk shape, wrap it, and chill the dough until ready to use; at least a half hour. Once your pâte brisée has chilled, remove it from the fridge and roll the dough out to 1/4″ thickness with a floured rolling pin. Transfer it to a 9″ tart pan with a removable bottom. Shape it, trim the excess dough, leaving a 1/2″ overhang, then fold the overhang over the pastry sides and press against the side to reinforce the edge. Pierce the bottom with a fork a few times and place it in the fridge for 30 minutes until it’s firm. While the pâte is chilling pre-heat the oven to 400 degrees. After the pastry has chilled, line the chilled shell with parchment paper and fill with pie weights. Bake until the pastry is set and pale golden along rim, 15 to 20 minutes. Carefully remove foil and weights. Meanwhile, put tofu, lemon juice, balsamic, dijon, salt and pepper in a blender or food processor. Blend until smooth. Set aside. Heat olive oil in a skillet. Add chopped shallots and chopped ramps and sauté until soft and translucent. Once done, add asparagus and thyme and sauté until the asparagus is just slightly soft but still bright green. Don’t cook it too much or it will get overdone. Transfer the asparagus mixture to a bowl. Add tofu mixture and chopped chives and stir well. Transfer filling with the vegetables to the pie shell. Put in the oven and bake for 30 minutes until golden brown and a inserted knife comes out clean. Serve with a green salad and a rosé bien frais.